Carlsberg UK has added to its premium craft beer portfolio, launching Jacobsen to the UK on-trade market in two variants, Jacobsen Saaz Blonde and Jacobsen Velvet. Pubs, bars and restaurants nationwide will now be able to stock the luxury ale range, named after the founder of Carlsberg, JC Jacobsen. Jacobsen Saaz Blonde is brewed according to Belgian traditions using Czech Saaz hops, which contribute to a fruity aroma and dry notes of angelica root, clove and coriander, while Jacobsen Velvet is a light golden ale that is soft, bubbly and sweet - without bitterness, with a vinous aroma and fruity notes. Established 10 years ago, the brand is brewed at the Jacobsen Brewhouse in Copenhagen, a cellar originally dug out of a hill (berg in Danish) in 1847. 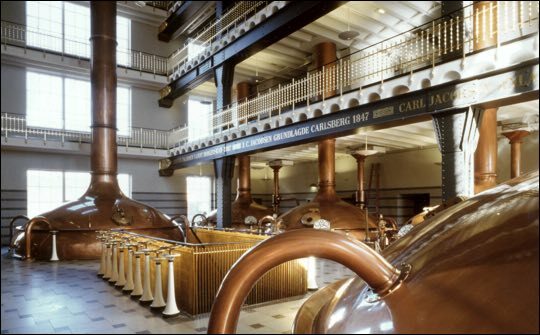 JC Jacobsen, titled the brewery Carlsberg – a combination of his son’s name, Carl, and the hill, berg. David Scott, director of brands and insight at Carlsberg UK, comments: “The brand was developed to encapsulate JC Jacobsen’s philosophy of ‘unlimited dedication’ – the promise to produce premium beers of exceptional quality, which is truly reflected in both the Saaz Blonde and Velvet variants. The craft beer category has exploded in recent years, and shows no signs of slowing down, having grown 21% in the past 12 months, now worth £439m to the UK on-trade (CGA Brand Index P5 16th May 2015). Alongside the craft movement, beer and food pairing is another burgeoning trend in the UK, and both Jacobsen variants are claimed to complement an array of different foods. Jacobsen Saaz Blonde is recommended with white fish and moulded cheeses, while Jacobsen Velvet pairs perfectly with seafood dishes. Jacobsen Saaz Blonde and Velvet are available now as part of Carlsberg UK’s recently refreshed ‘Crafted’ range, 7.1% abv and 5.9% abv respectively, RRP: £6.00.